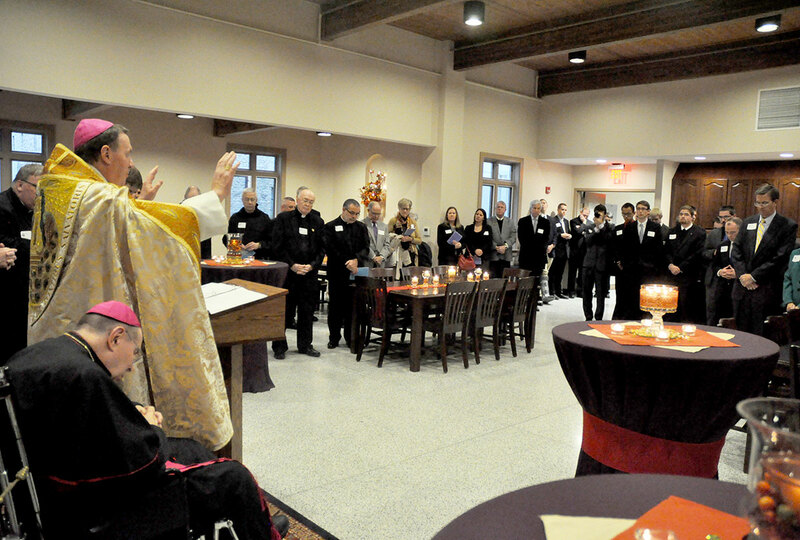 The continued growth of Bishop Simon Bruté College Seminary in Indianapolis was celebrated on Oct. 21 as Archbishop Joseph W. Tobin blessed and dedicated its new dining hall and dormitory. Archbishop Emeritus Daniel M. Buechlein, who founded the seminary in 2004, attended the event. The seminary’s dining hall was named in his honor. The dormitory, which features 10 double occupancy rooms, is named St. Bonaventure Hall. The $2.6 million project, which also included the renovation and expansion of the seminary’s chapel, was largely funded through the estate gift of the late James P. Scott of Indianapolis. The event was attended by the 43 seminarians—from 10 dioceses—who are enrolled at the seminary. Others at the event included benefactors and members of the seminary’s policy and advisory boards and representatives of Marian University in Indianapolis, where the seminarians take classes as part of their intellectual formation for the priesthood. At the end of his remarks, Archbishop Buechlein addressed the seminarians. Seminarian Timothy DeCrane, a senior at Bishop Bruté, is grateful for the good example of ordained life and ministry that he has in Archbishop Buechlein. Father Robert Robeson, rector of Bishop Bruté since its founding in 2004, said during the ceremony that he thanks God every day that Archbishop Buechlein appointed him to lead the seminary. Before the event, Father Robeson also spoke of the central role that Archbishop Buechlein played in helping the seminary get to where it is today from humble beginnings. Although Archbishop Buechlein retired from leading the Church in central and southern Indiana in 2011 because of health issues, Father Robeson said that his influence is still felt in the seminary. When the seminary moved to the former Carmelite Monastery of the Resurrection in 2008, it had 18 seminarians enrolled. Father Robeson said that he and other people helping plan its future expected it to grow to its optimal size of 48 to 60 seminarians. They just didn’t foresee it growing so quickly. Father Robeson said that the new dining hall named after Archbishop Buechlein contributes to this environment because it easily accommodates the entire seminary community for meals and as a place for formation conferences and studying.